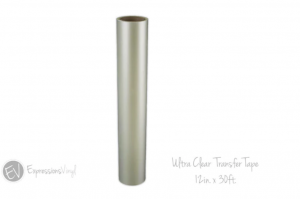 Transfer Tape is a necessary supply when working with adhesive or stencil vinyl. It is used once the design has been fully cut and weeded. (aren’t sure what I mean when I say weeded? Check out this post here.) Basically the transfer tape keeps the design 100% in tact when moving it from one place to another. This type is by far my favorite and most used. I absolutely love that it doesn’t have a backing and I don’t need scissors to cut it. 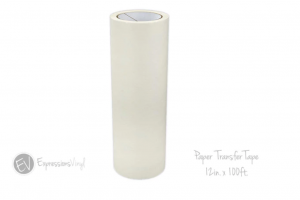 It is thin like paper so it can be easily ripped to the size of the project you need. The paper style of tape isn’t 100% clear but you can see through it enough to line up a project. It comes in several different widths and isn’t overly sticky. 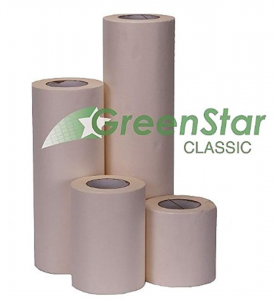 The level of tack a transfer tape has impacts the ease of use and the paper tack level is perfect. I have two types of paper transfer tape that are my go-to brands. This one and this one. Paper transfer tape is the kind that I used with oramask stencil when creating this growth chart. The next style is clear. This type of tape is the kind to use when something needs to be lined up 100% perfectly and there is no room for give. For example, when you are creating a decal with multiple layers like we did here. Just as a warning the clear option can be a tad bit sticker than the paper but the benefit is you can see exactly what you are doing from both sides. 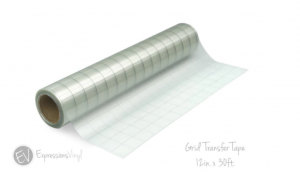 This is my favorite type of clear transfer tape. The last type of transfer tape that I use on the regular is clear with grid lines. 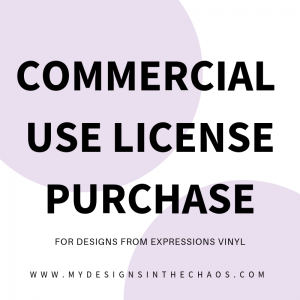 I recommend using this style when you are creating or even selling decals that will need to be lined up on something else evenly. For example on the back of a car or on a wall. The grid helps to ensure that you or your client is able to have the final product lined up exactly even. The grid lines are subtle and the rest is clear therefore making it easy to work with and align. Unlike the paper you will need scissors to trim to the correct size. Opaque transfer tape is also available but I find that I use this style the least since it is harder to see through and you need scissors to trim it. 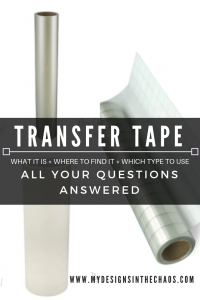 Here is a quick little chart that helps to determine which type of transfer tape is best for the project you will be completing. 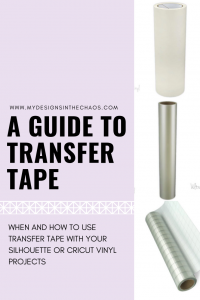 Hopefully this clarifies for you exactly what transfer tape is and when you should use what type. So now it is your turn… which type do you find you use the most? Also don’t forget to pin the above chart for future reference and share this post with a friend who is just learning about all the types of tape. Happy crafting, cutting, and chaos friends! Disclosure: We do get paid a small percentage when you shop through our links, but all opinions are 100% our own.